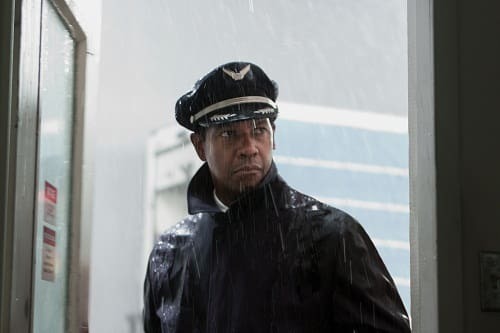 The reason that Flight manages to work is a trifecta of talent: Denzel Washington, Robert Zemeckis and screenwriter John Gatins. Those three have created a character that does the most heinous of things, emerges from the fire like a phoenix as a hero… only for the audience to discover that he may be anything but. Why else could you explain why a theater full of people is pulling for someone who committed a felony to get away with it with such enthusiasm? It is because of Gatins’ script, Zemeckis' crafting of heavy-handed morals meets alcohol and drug-soaked fun and how the Washington persona and performance meet on a character that is all kinds of shades of grey. Washington is Whip Whitaker, a veteran airline pilot who lands a plane in a freefall that should never have landed… period. Whitaker’s tenacious flying and boisterous command of his plane are nothing short of a miracle. When he awakes in an Atlanta hospital… he is called a hero, but something’s remiss. Whitaker knows that there could be alcohol or drugs in his system. Even though he saved almost a hundred lives, through Washington’s dramatic eyes alone… the viewer knows a storm is coming. Bruce Greenwood is the first soul that Whip sees after he awakes in the hospital. He represents the pilot union and is an old flying buddy of his. Although happy to see him, why is he here? When the National Transportation Safety Board enters the room -- the reason is revealed. Although he believes he acted heroically, a plane did crash and an investigation must happen. His lawyer (played with steely grace by Don Cheadle) and Greenwood assure him that if Whitaker can stay sober, he could still emerge from this with his halo intact. Unfortunately, that proves to be more difficult than landing an inverted jetliner. There’s a storyline in Flight that distracts from the overall dramatic drive of the film. Washington meets a heroin addict in the hospital after the crash and the two forge an unnecessary love connection. We know it is meant to enhance the themes of the film, but tragically it does the opposite. The director is back doing a “live action” movie after twelve years and as he said in our Zemeckis interview, “movies are movies.” That is clear with his solid handling of a morality tale wrapped in a hero’s story where the audience cheers for a man whose intentions are solid, yet demeanor is criminally off.